Dr. Pragya Agarwal, A Designer, Printmaker and Academic Mentor, crafting words and things to inspire, empower, dream and think. Follow on Twitter @hedgehogprints. The movie ‘The Big Sick’ has recently been released in the theatres here in the UK. I wrote a slightly tongue-in-cheek, humorous, but with an underlying serious message, blog post from my own personal perspective on cross-cultural relationships. The Big Sick, a film about a cross-cultural relationship, is making news at the moment. In this, a Pakistani man meets and falls in love with an American woman, and the movie highlights the issues they face in the early stages of their relationship due to their cultural differences. I can perhaps raise eyebrows at some cultural stereotyping in this film, but it is funny and I accept that it is an exaggerated version of reality. But does it really truly show the rich wonderful fabric of a cross-cultural relationship? I am an Indian married to a British Man who was brought up in Scotland. We’ve known each other for 17 years, and married for 7 of those. We bonded over the love of cricket. He loved having a girlfriend who not only went to his cricket matches, choosing to spend her Saturdays stuck in a field somewhere, but could also offer to keep scores for the team. I loved his dry wit and his Scottish accent. 1. I get another festival holiday to celebrate: We, Indians, love festivals and religious holidays. On an average, I would estimate that we have one every fortnight. It’s especially amazing when you are not particularly religious as then it is actually a holiday. Marrying my husband has meant that I also get more festivals to celebrate. Christmas, of course, celebrated with an unmatched zeal in our household, preparing for the Christmas dinner as if it was our last supper every year, but also St George’s Day and St Andrew’s Day. They are saints after all, and we Indians are big fans of all saints! I get to experience different cuisines too, like the amazing trifle that his Mum makes, although I believe that I could match it, if not surpass it (see that Indian competitive spirit right there!). 2. I can blame much on my cultural idiosyncrasies: Each time I behave oddly, which my husband would say was much of the time, or pronounce a word wrong, which after almost 18 years living in the UK is inexcusable, I can comfortably blame it all on my cultural background. ‘Of course, I am Indian,’ I mutter often, and it’s just accepted without any question. If I eat rice with everything, it’s because I am an Indian, or argue very loudly with my parents on facetime but appear quite nonchalant about it, it’s because we are Indians and we are passionate people. It is rather fun to have my whole cultural background to fall back on and blame for all my choices, without my husband questioning it! 3. I can speak my own language when I am disgruntled: I am grateful for my language that I do not speak at home ever, and which my husband has not learnt much of except the very useful words such as ‘aloo gobhi’ and ‘saag aloo’. When I am angry or want to mutter under my breath at someone, I can always resort to Hindi. I can speak Hindi to my children and it feels more intimate somehow, as if I am passing on the secrets of an ancient civilisation to the next generation, even though what I am saying is mostly for them to clean and wipe their face, finish their food, or not to snort loudly. 4. 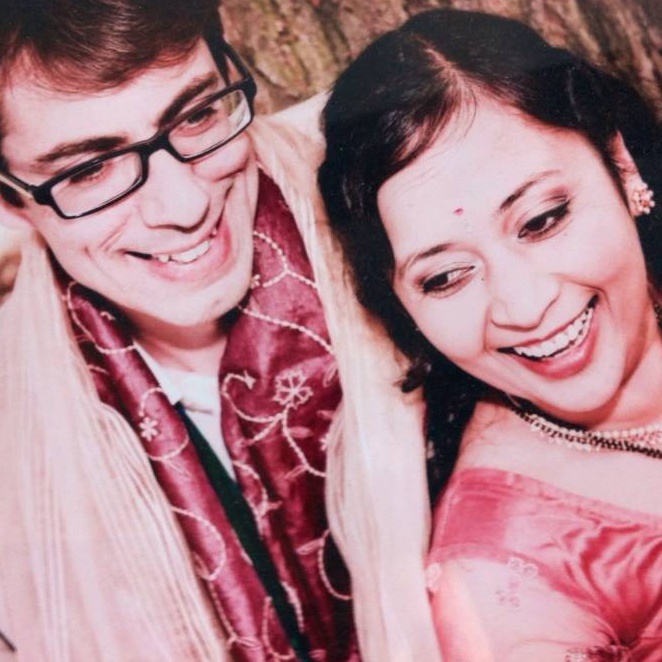 Our wedding was fun to plan: We had the most amazing Indian-Scottish wedding, and there was so much to inspire us from both cultures. We had bagpipes and sanskrit chants, onion bhajis and haggis, bhangra and ceilidh, wore Tartan and Indian saris, and had roses and thistles, national flowers from both countries. It was a beautiful day, where it did matter where we were from, because we took the best of both and celebrated it together. Who knew that curry could be such an ice-breaker?! I am surprised that they haven’t introduced curry into any international negotiations and agreements. Jokes aside, on a more serious note, there are certain challenges that come with a cross-cultural relationship too. The notion of humour and what we find funny can sometimes be different. I love the wry British sense of humour, and my own fits in here perfectly, but at times I wish that he could understand the nuances of Indian humour, some of which loses the meaning when it is translated. I wish that he could laugh at Indian films and Indian families, in the affectionate way that only we can and only we are allowed to. Parenting can be a challenge at times, and although we share the same values of kindness and respect, and similar life goals, let’s just say that it has caused some tensions in our household as to what constitutes hard work, and how liberal one can be with teenagers. Communication can certainly be a challenge at times, because there is an extra layer brought in by our cultural baggage, to the usual communication gaps that can occur between a couple. This cultural inter-mingling has certainly influenced my art and my life a huge deal. I love Scotland, and made this linocut inspired by the Scottish Highlands. This is another piece that features the Highlands, and I love how the stark monochrome brings out the beauty of the mesmerising landscape. I love the quirky ritual of going to the beach even when it is chucking it down, and the deep love that the British have for the beach huts. I love the architecture and sense of history in so many British towns, whether Edwardian, Victorian or Industrial and love capturing them in sketches and drawings. People have an inherent sense of beauty and a desire to surround themselves with art, and I so enjoy making bespoke artworks and prints on commission because it is so very personal. The Big Sick doesn’t show life after the protagonists get together, where new challenges confront us. We are still learning how to communicate and understand. There are new experiences every day, which are so critical for a creative and productive life. True hope and desire for progress comes from fostering new ideas. I would think that we bring the best from both cultures together in this melting pot, and are truly representative of a changing world, where such relationships are the norm rather than something out of ordinary. Pragya is a researcher, designer, educator, writer, and creative director at Hedge & Hog Prints, a design studio making original and thoughtful art and illustrations. She is also the founder of a social enterprise, The Art Tiffin, campaigning for creativity and cruelty-free art materials. She was born in India and now lives in the North-west of England, near the sea, with her three girls, her Scottish husband, her dog and her cat. My Boyfriend and I Come From Different Cultures. How Can I Bond With His Family?